In The Wild Wood, Cecily Daye discovered who she was, embraced the trials she was born to endure, and emerged with a power unrivaled in the world. The moment Cecily came into her true power, the world changed. Every living being felt the surge, the awakening of a power that could destroy all life. Both friends and enemies look upon her with suspicion and wonder if she will use her power for justice instead of treachery. As beings—men, mystics, and monsters—scramble for more power to offset the limitless will of Cecily Daye, one force—the Source—understands the mistake of her birth, the mistake that can be undone. While her friends and boyfriend battle the horrors awakened by her existence, Cecily stands alone facing the Source. But Cecily's greatest foe is the question she holds deep within her heart: should she even be allowed to exist? Enter The Downs. "I mustn't burden you with who you were when you need to figure out who you are." "Will you at least tell me if he is an enemy or a friend?" Lille paused, staring at the water and flinching slightly. "Who can tell? One day you may be my enemy. One day every friend may turn. It only takes a single decision to change anyone or anything." "Because having power and using power are two very different things. The Commanders' power is not to be borne. It is indiscriminate and a horror once unleashed. We could stop this war in the most permanent way." Morgan shuddered. "Okay, that wouldn't be so helpful." "Which is why we watch." "To fear the future is to lose the present." After falling in love with Julie's writing style, narrative, and plot of The Wild Wood, I quickly jumped at the chance to review the next to books in The Sevens series. Don't ask me why it took me so long to pick up The Downs, but it did and I'm sorry that it did. The Downs picks up where we left off in The Wild Wood, with the Conquerors and the Protectors heading back to their home, Darienne. Of course once on the shores of Darienne, the mystics stop Cecily, her sisters, and both sides of the war from entering, believing that Cecily shouldn't exist and will destroy them all. After demanding to be let in and helping those with her to cross the deadly water, Cecily disappears in an explosion of black smoke. With her gone, those not so great individuals take it upon themselves to use her gone to their advantage. What I found to be extremely interesting is that Julie doesn't keep the story solely focused on those in Darienne. Her narrative goes back and forth between Darienne and those back in Dunlowe. Even then, within Dunlowe, the narrative breaks down into two separate narratives. I know this may sound terribly confusing, but Julie pulls these multiple narratives off with flair and finesse. I was never confused or bored with any of the narratives and found myself to be completely enraptured with each of them. She all knows exactly when to switch narratives to ensure you don't put The Downs down (ha) because you absolutely have to find out what it going to happen. Julie focuses more on other characters than Cecily this time around, which I found to be enjoyable. Minor characters from The Wild Wood become major characters and we learn so much more about this mysterious world. Of the Sevens, she puts main focus on to Morgan - whom I love - and Stephanie - whom I'm never going to like. These girls are coming into their powers and we are slowly learning more and more about their previous selves. Honestly, I would love to see some sort of companion novel regarding said previous selves, but I'll have to settle with the information drops as we go along. Not that I'm complaining, each information drop we get it a wonderful insight into these characters. 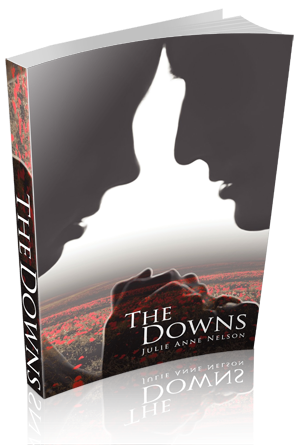 With wonderfully flowing narratives, strong developing characters, and a mystery around ever corner, Julie's novels will keep you entranced until the final page. Of course, you'll be hungering for more after that! This series is unlike any fantasy series I have read before. It's a unique story line that will delight any reader of any age.